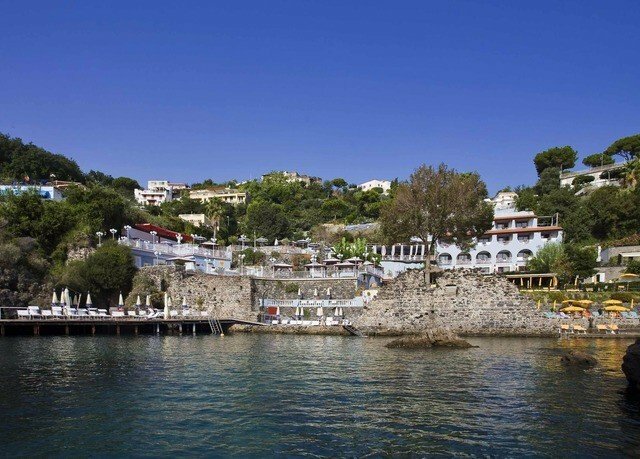 Enjoy the stunning beauty of the volcanic outcrop of Ischia, the largest island in the Bay of Naples that’s often forgotten by those who flock to the Amalfi coast. 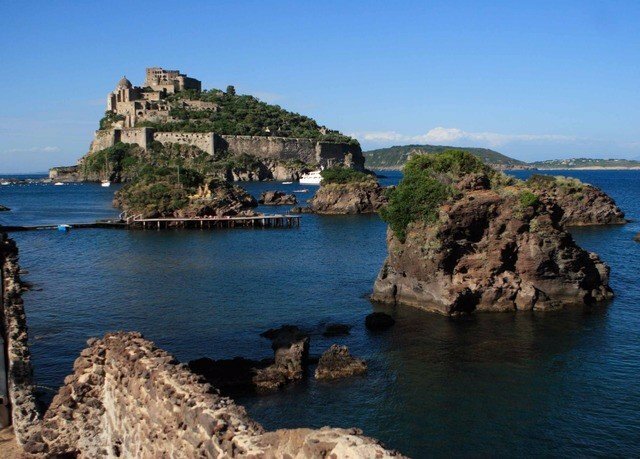 Their loss, however, is your gain, as fewer visitors to Ischia means you get more of the crystal-clear waters of some of the best beaches in Italy to yourself. 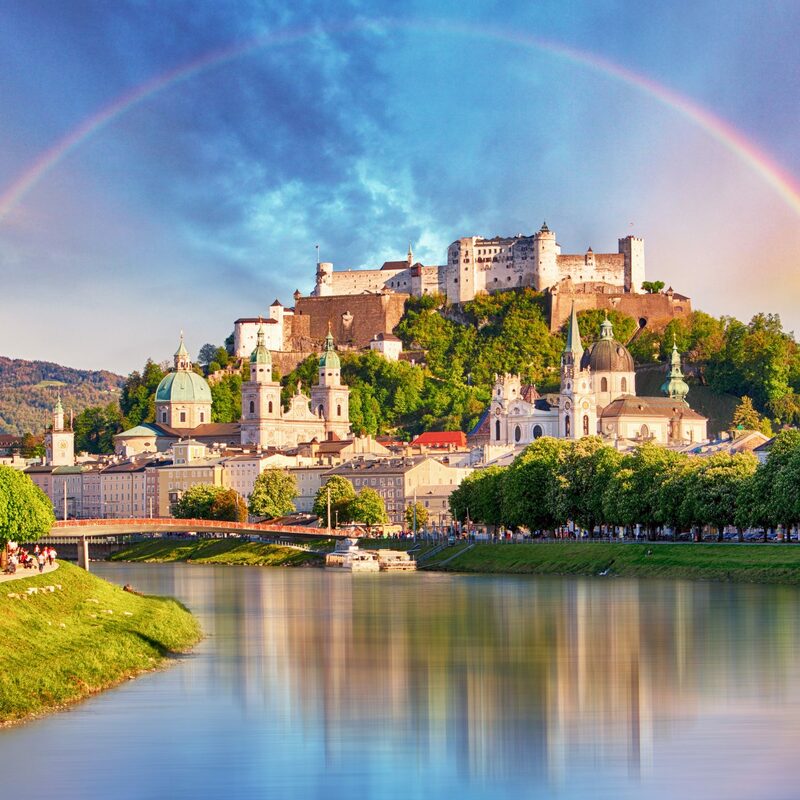 Couple this with the intriguing Tyrrhenian culture, with necropolises, sun-kissed villages and mouthwatering seafood in its cuisine, and you have the perfect recipe for an Italian dream vacation. 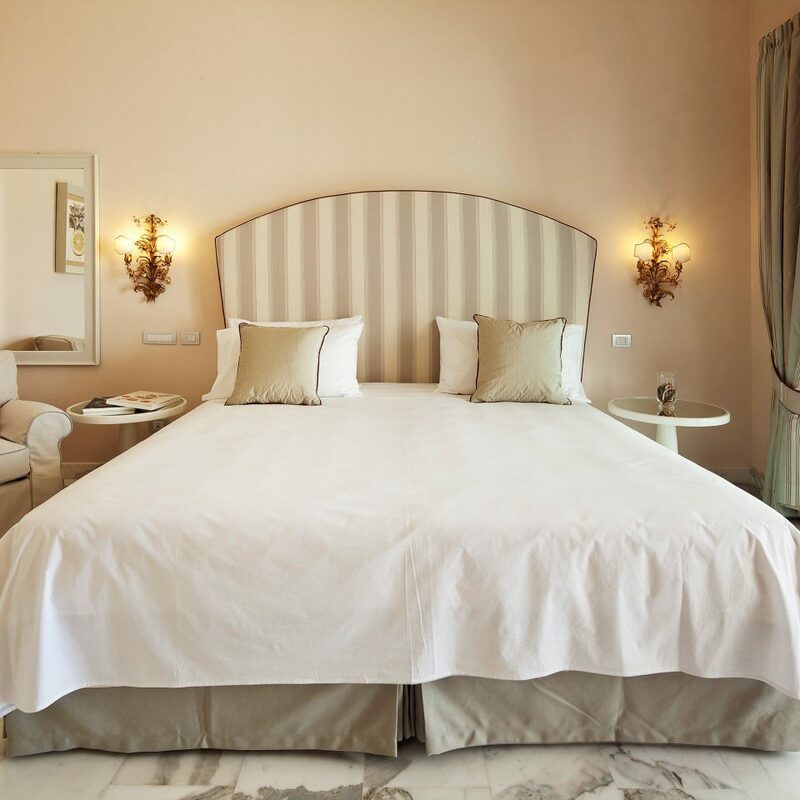 In the midst of all this, Strand Hotel Delfini Terme is a destination and dream unto itself. 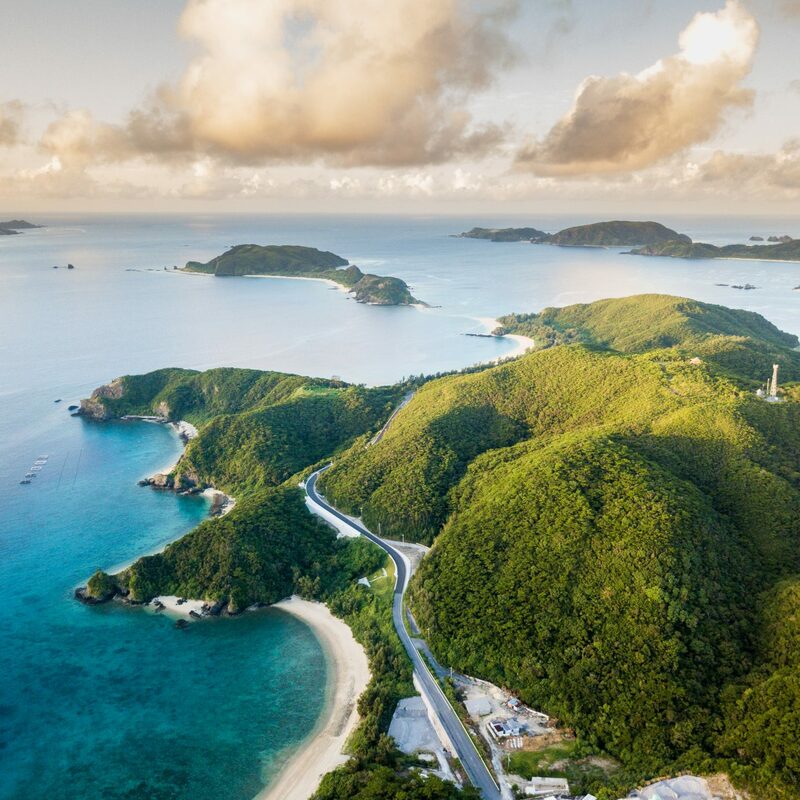 Decked out with elegant neoclassical furnishings, and boasting simply incredible views from its selection of outdoor terraces, this escape has no shortage of special places to see and things to do. 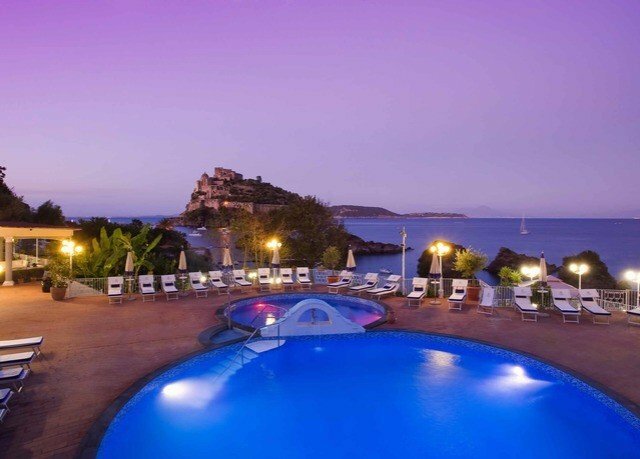 There’s even a private beach on the enchanting Cartaromana bay, framed perfectly against the backdrop of the majestic Castello Aragonese. With pools fed by an ancient thermal water table, as well – one which the Romans exploited centuries ago – Delfini is like no other. And if you don’t find yourself relaxing and slowing down just being here, there are spa treatments that can help. 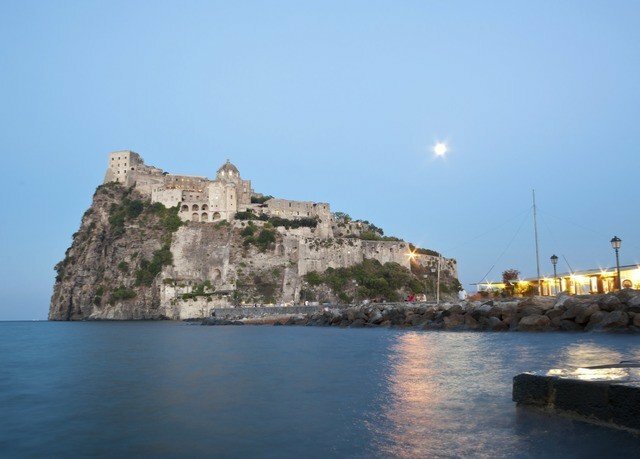 You’ll be all recharged in no time – and you’ll need to be, if you’re to take on the bustling bars and restaurants of Ischia Porto when evening falls. 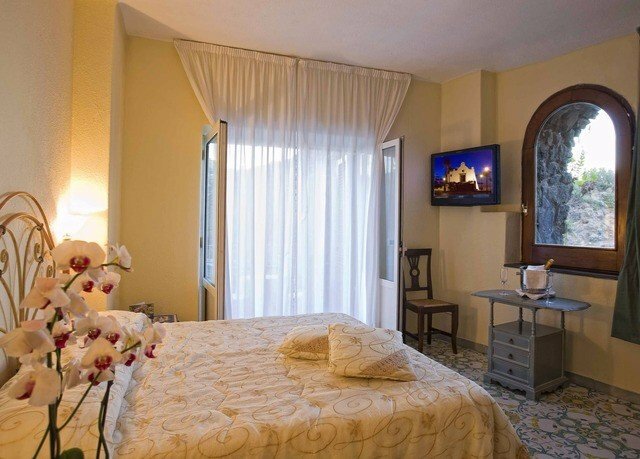 Rooms are bright, with a classic style, befitting the great views on offer. With a balcony or shared terrace at your disposal, you can enjoy winding down all the more. In the Deluxe room, in contrast to the Standard room, you’ll find a multi-function bath/shower for Turkish bath, plus music-therapy settings and intricate hand-painted floor tiles. 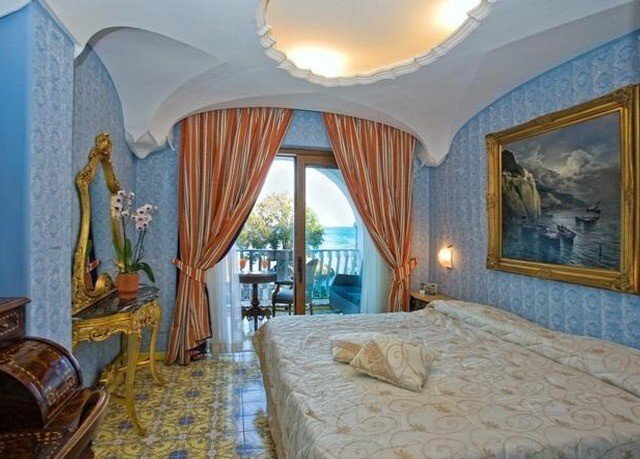 In the Prestige room, you’re guaranteed a sea-facing balcony, with views of the Castello. 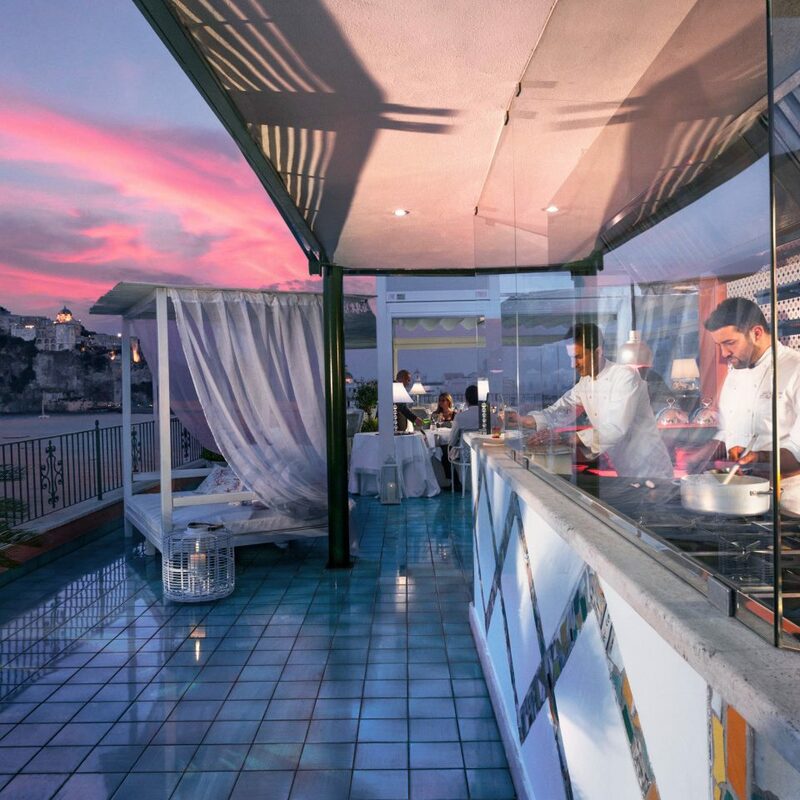 The opulent dining area is elegantly decorated, with its cuisine highlighting fresh produce from Ischian land and sea. Tables are set up by the pool area on occasion, a perfect spot for evening views of the bay. 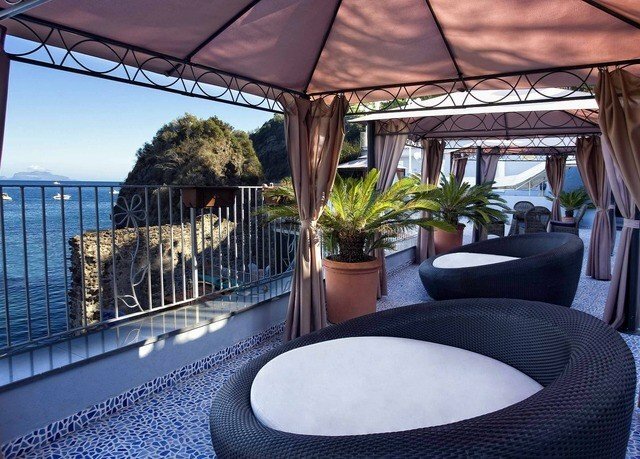 A spa offers waters from the famous thermal water tablet that lies under volcanic Ischia, plus extra treatments for face and body, along with salon services. Features here include a swimming pool that’s heated to 96° F and hydro-massage facilities. 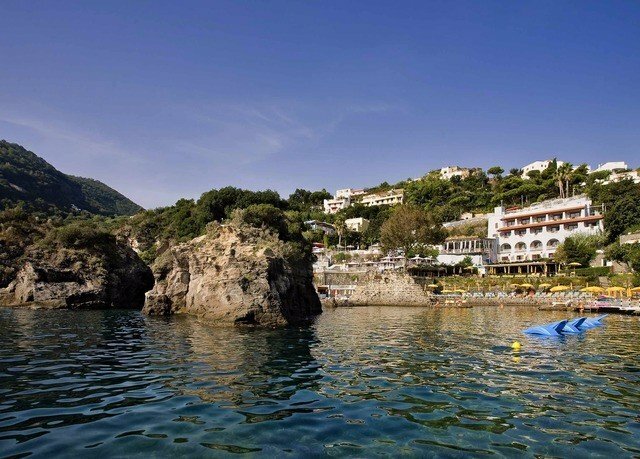 The hotel is set within one of the most romantic bays of the island, the Cartaromana, and is just a short distance from the center of picturesque Ischia Porto. 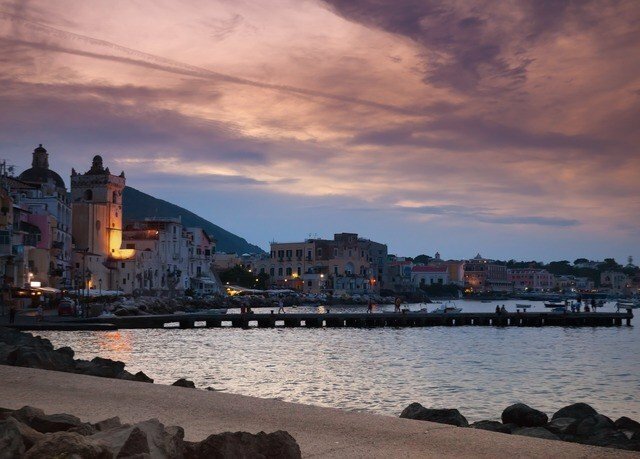 About half an hour walk, this area is packed with pastel-colored trattorias and great seafood restaurants – with plenty of great bars to swing by after dinner. 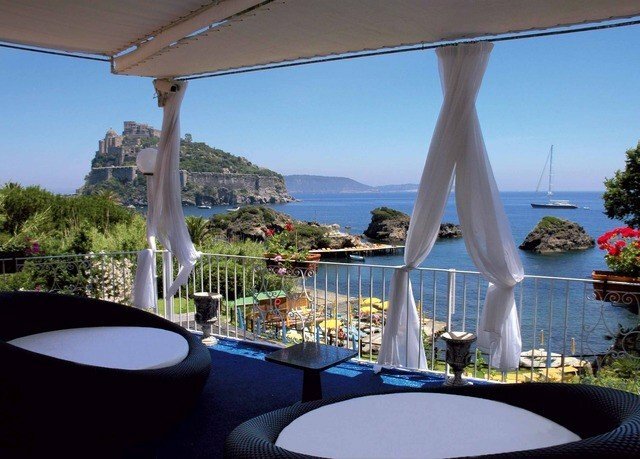 Stunning views of Castello Aragonese surrounded by the sea! Beautiful location, wonderful sea views. 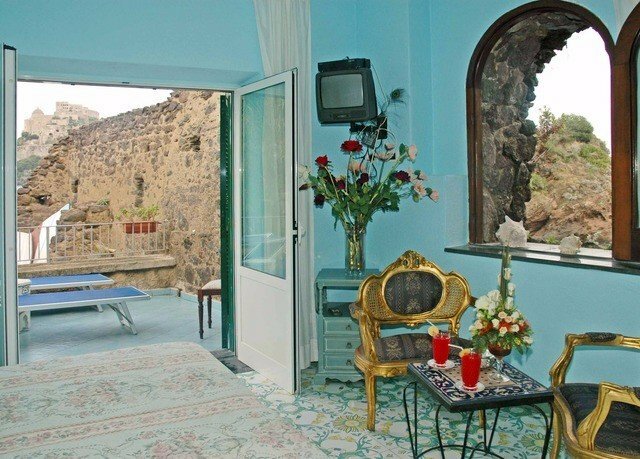 We had a romantic suite with a luxurious decoration and a piano... stunning views of Castello Aragonese surrounded by the sea. 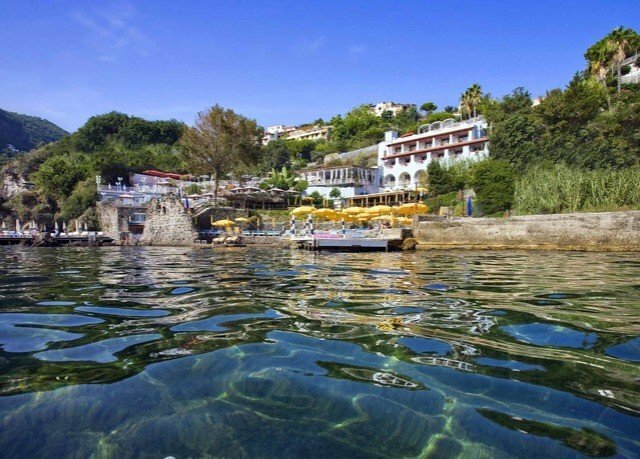 Charming and quite place, with thermal pool, swimming pool, lounge near the sea / beach / solarium. 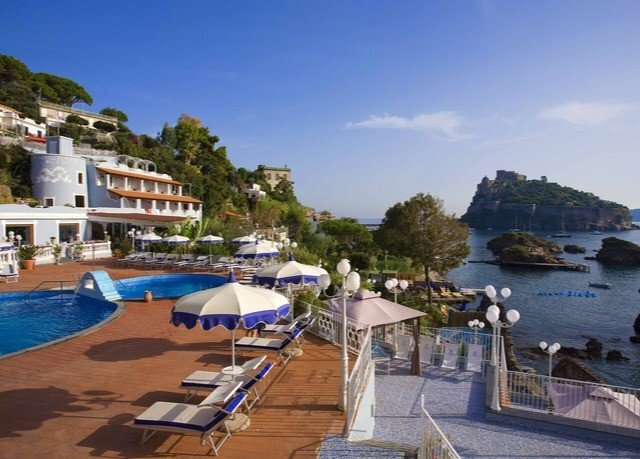 A minibus takes about 5 mn to Ischia centre and stops every hour in front of the hotel. I am looking forward to returning next year. The service was friendly and helpful. The room was clean and spacious. The view from my room was unbelievable. Every day I heard the waves from the ocean outside. The sunrise was colorful. The food was fantastic. Three meals a day and I never felt bored. The location was convenient. The bus stops right outside. There is a private beach and a free shuttle to a nearby hot springs. You will not be disappointed. I was nervous booking this hotel in the first place and if I could go back I would have trusted my instincts based on the bad reviews. Believe them! This hotel is not excellent, very good, or even average and I don’t quite understand why it has the reviews it does. It was so bad that we checked out early because I couldn’t stand how dirty it was. For starters, there were construction items on our balcony and the space was clearly used for storage, which made me uncomfortable wondering who would be wandering on our balcony from the outside area. There was mold in our non functioning shower, indicative of the shower not being cleaned properly for a long time. I walked barefoot in my room and got a ton of dirt on my feet! The floor had obviously not been cleaned well before my arrival. The refrigerator in the room was very old and had chips of it missing. The condition of the resort was shameful and should only be rated 2 stars at most. Don’t expect them to reimburse you based on their cancellation policy. No ethics with regards to that either. They claimed they couldn’t resell my room. Not my problem if I’m checking out within the bounds of your cancellation policy of 50% refund. Just bad. Stay at the Garden Villas and Resort instead. Better location. Better all around. 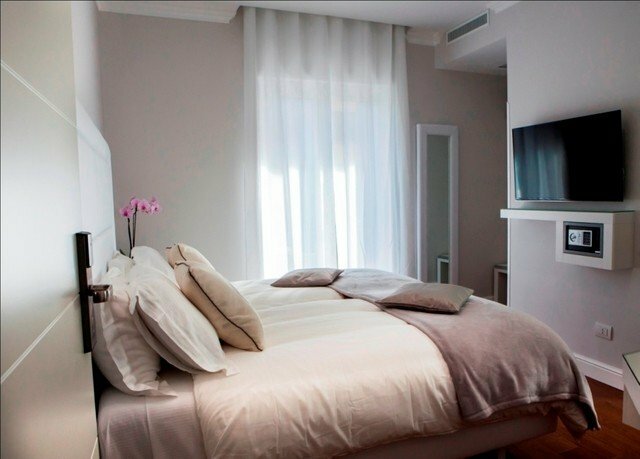 Where does one begin when reviewing Delfini Strand Hotel? For the sake of simplicity let us begin at the arrival and conduct the post-mortem of one of the more 'interesting' hotel stays of my life. My wife and I, on our honeymoon, took the ferry from Naples to Ischia. First impressions of Ischia was that it had the feeling of the Calais jungle by the seaside, it gave off a rather faded glory vibe, not that there was much glory to begin with. For those arriving by road upon alighting from your transport you are met by the welcoming arch of I now affectionately know call 'the Delfini', complete with broken menu board with a menu which never changes, broken pots and a 40-stair descent to the reception. A porter for my bags, I hear you ask. Ha! No, you can haul your bags down in the hot Neapolitan sun. As an aside, and something which we found to become apparent later in our stay, The Hotel runs a pseudo-triage system of management, whereby essential tasks are prioritised over non-essential...all of which are ignored in favour of the most critical task of setting out knives and teaspoons on small, hand crumpled paper napkins, more on this later. All of this is competed by a member of staff called Donato, who appeared to be the restaurant manager, customer services representative, waiter, chief knife-and-spoon placer, and by the looks of things also in charge of repairs and maintenance. On the topic of maintenance it is fair to say that the hotel is poorly maintained. Doors rattle in their frames, paint and plaster fall from the ceiling and walls at such rate it looks like there has been snowfalls in some areas, balconies are rusted and discoloured, fixtures and furnishing are tired and broken, leather has perished of the sofas, tables and chairs and plastic and cheap and the sea-side lounge area is just timber board over a rusted frame (and I counted four used female sanitary pads in the sea-swimming area). Once at reception my wife and I waited to check in. Check-in runs on Italian time so I hope you are not in a rush. Our first room was down another flight of stairs, again, no porter. The room had no windows, a mattress which I can only assume was a foam replica of a water bed and had not seen fresh paint nor screwdriver since 1976. Fixtures and fittings were tired and stained, handles were broken. The room, a standard room, opened onto a shred terrace which was co-habited by some very socially unaware children. At this point, tired, hot and extremely disappointed, my wife in tears, I complained to management that the room is not fit for human consumption and asked could they please change it. I have given the Delfini a two-star review purely based on the efforts of the receptionist to move our room. Agnese (apologies if I spell this wrong) was extremely helpful while working under immense pressure and I can only thank her for her effort to improve our stay. 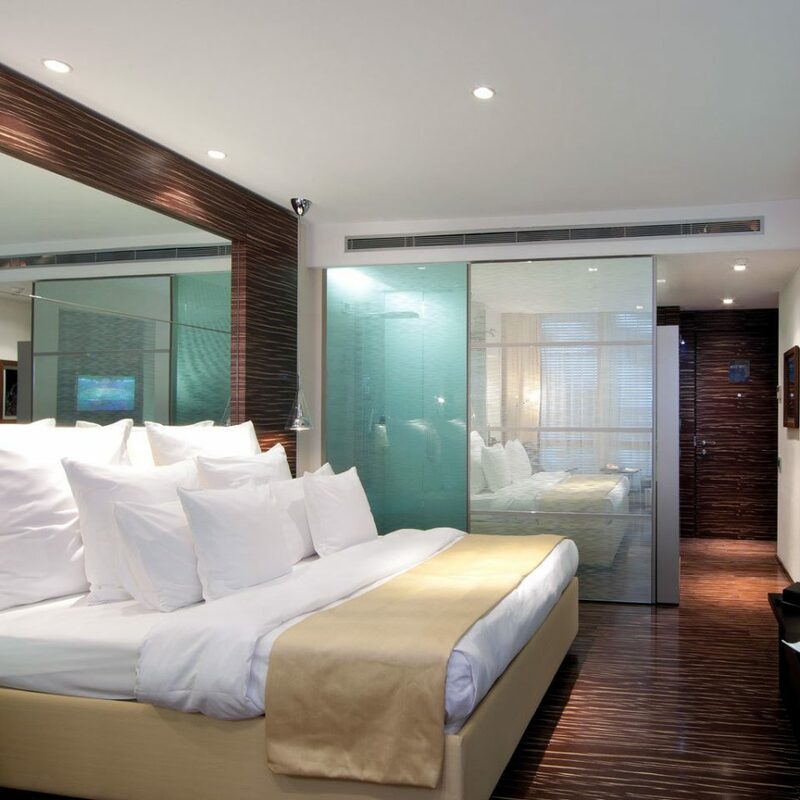 We were immediately moved to a "deluxe room" with a private balcony and slightly larger internal area. The room suffered from the same failings as the last; tired fixtures, cigarette ash on the table, and an electric shower which seemed to only be able to play the radio. The terrace was dirty, there was some sort of excess timber on one corner and the furniture was the plastic-garden style that my late-great-grandmother had in the early 1990s. 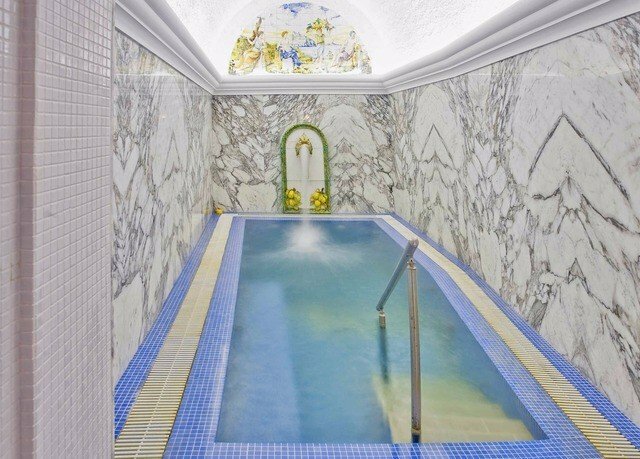 I like to imagine that faced with many poor reviews the management of Delfini sat down and said to themselves the way to get the public back on side is to install electric jacuzzi showers in the room which play music, because that is what the people want over and above cleanliness or a good bed. 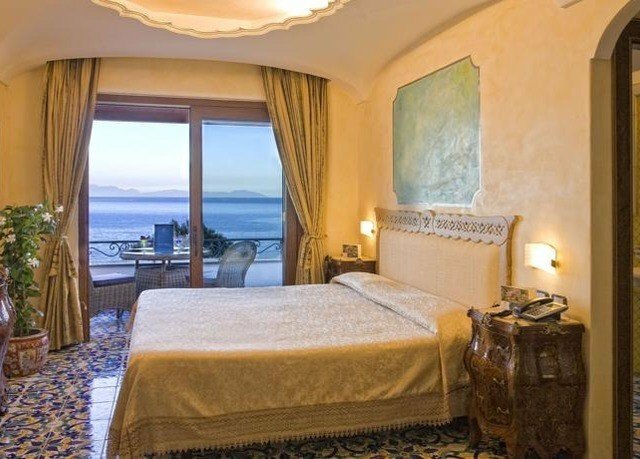 The air-conditioning did not work, a problem when the sun, reflecting off the Bay of Naples comes streaming into your east-facing room, the thermostat read 28 degrees at 9am. We complained again about the room and were advised that there was nothing which could be done until the next day. Nothing to do then but to sit by the pool - there was a children's party and more than one band-aid floating in the pool; observe the dinner service - terrifying, avoid; and enjoy the eurobeats and fireworks which continued until midnight for the said children's party. All in all a disappointing first day. Breakfast, described as 'good' by booking.com was a plate of disappointment and watered down cordial. The cheese selection contained actual cheese slices still in plastic. Enquiring about our room and if we could have air-conditioning, the receptionist said she would move us. We were moved to the imperial suite...this was pleasant, maybe a bit over the top but did stop us complaining. The hotel's website quotes the nightly room rate as EUR 3000 pp, how disappointed one would be if they paid the full price, maybe EUR 400 would be more realistic. 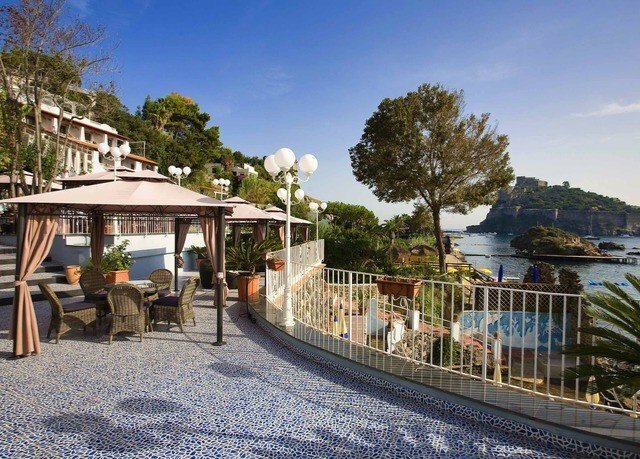 We spent a further two nights in the suite, enjoyed the view - which was made the better because you cannot see Ischia or the hotel - and drank Aperol spritz made without soda water by with quite foul orange slices. 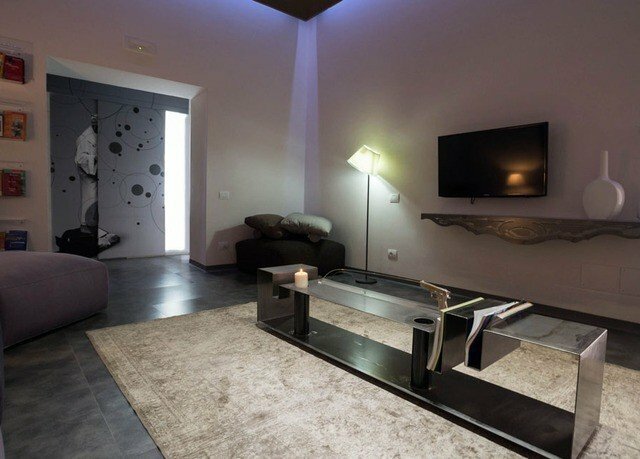 In all, Hotel Delfini requires some serious capital expenditure to bring the hotel up-to-date. Some staff are trying very hard with limited resources, others seem to not care. I do hope the hotel management choose to make the investment. My wife and I spent €20 to use the pool and Spa facilities at the hotel which is in an amazing setting with the most beautiful views. We were truly glad not to be staying here as the hotel is old fashioned, pools etc are extremely run down and not very clean. There was a tiny bar inside the hotel , no staff around the pools or terraces at all and no means of getting a drink unless you climbed up the flights of stairs to the minuscule bar inside the hotel, which was only manned when requested by reception staff. The hotel needs vast amounts of money spent on it but friendly welcoming staff, drinks, ice creams etc around the pool and the availability to buy snacks etc would help. Surely it would be in the financial interest of the hotel to open up the beachside cafe?